This entry was posted on October 21, 2012 at 10:51 AM	and is filed under Memory, SQL General, SQL Server Engine, SQL Server memory. Tagged: Changes in SQL server memory, denali memory model, mssqlwiki.com, sql server 2012 changes in memory, sql server 2012 memory architecture, sql server 2012 memory management, SQL Server 2102 memory changes, sql server maximum server memory, SQL Server memory, SQLServer memory architecture changes. You can follow any responses to this entry through the RSS 2.0 feed. You can leave a response, or trackback from your own site. ‘SQL Server 2012 “max server memory” configuration does not include only the following allocations’ makes no sense?? So do I read this as..
3. Plus others that I am not going to tell you about??? Or am I misinterpreting it all together? 1. 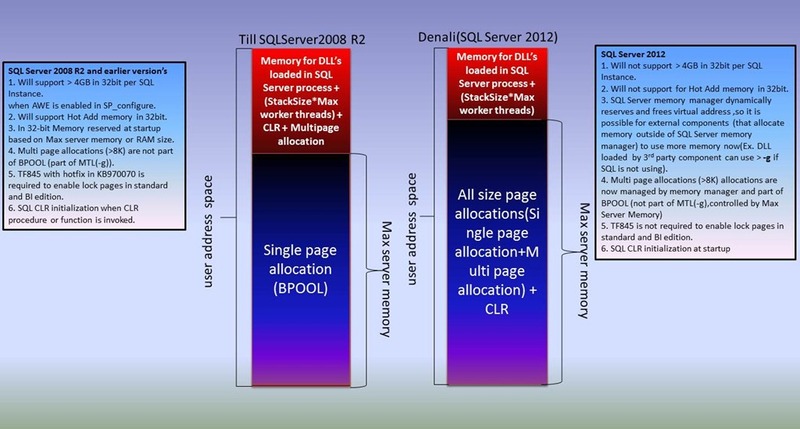 Memory allocations for thread stacks within SQL Server process and 2. Memory allocation requests made directly to Windows [Ex: Allocations (Heap,Virtualalloc calls ) from 3rd party Dll’s loaded in SQL Server process , objects created using OLE Automation procedures (sp_oa) etc] are not controlled by max server memory . Assume you load a DLL in SQLServer process and the DLL allocated 5GB of memory. It is not controlled by max server memory…. So does all the text\image pages will come under multi page allocations (outside Buffer pool) in sql server 2008? All the data pages including text and image will be inside bPool.